If you want high-end features but can’t quite stomach the price of the Samsung Galaxy S10, then Samsung might have an alternative for you in the form of the newly-announced Samsung Galaxy A70. The phone packs a 6.7-inch 1080 x 2400 screen, which makes it the largest handset in the A range. It’s a Super AMOLED screen with a super-wide 20:9 aspect ratio, a notch at the top and just a slim sliver of bezel at the bottom. And while there’s no punch-hole here the Samsung Galaxy A70 does have an in-screen fingerprint scanner. That’s not the only high-end feature either, as the phone also has a triple-lens rear camera, made up of a 32MP f/1.7 main lens, an 8MP f/2.2 ultra-wide lens and a 5MP f/2.2 depth sensor. There’s also a 32MP f/2.0 lens on the front. 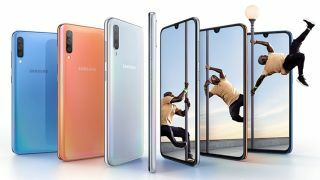 The Galaxy A70 additionally has a big 4,500mAh battery with fast charging, an octa-core chipset, 6GB or 8GB of RAM, 128GB of storage, a microSD card slot, facial recognition, and it runs Android 9 Pie, overlaid with Samsung’s One UI. The design meanwhile includes a ‘3D Glasstic’ back in coral, blue, black or white, with a prism effect that reveals gradient colors depending on the light direction and reflections. What we don’t know is how much the Galaxy A70 will cost or when it will go on sale, but Samsung says we’ll learn more at its event on April 10. We were expecting three new Galaxy A series handsets to be announced at that event, so it’s not clear whether this counts as one of the three or not. We have also heard rumors of a range of other A series handsets, including the A90, A60, A40 and A20e. Then there’s the Galaxy A50, Galaxy A30 and A10, which have already been announced for some parts of the world but aren’t yet available in Europe, so we’re not sure which combination will be shown off at this event.